A common question new users ask is "How can I plot an equation?" I think people expect that charts have a magical ability to accept an equation and spit out a graph of X vs. Y. Excel charts aren't that smart, though: they can only plot data values that you assign. To provide this data you need to enter X values into one column (or row), and calculate the corresponding Y values in the next column (or row). Then select this data and create an XY chart to show the relationship. Suppose for example you wanted to plot the relationship between the Fahrenheit and Celsius temperature scales. Enter descriptive headers into cells A1 and B1. Enter X values of interest into A2 through A5. Enter the following formula into cell B2, then copy the cell (Ctrl+C), select B3:B5, and paste (Ctrl+V). For this simple linear relationship, all that you really need are the lowest and highest X values of interest. And it's not necessary to use markers for the individual data points, unless you want to use the data markers to point out particular temperatures. Select the range A1:B5, or select a single cell in this range (Excel will figure out which data to use), and start the chart wizard. In Step 1 of the wizard select an XY (Scatter) Chart, and choose a subtype that connects points with line segments. You should not choose a Line Chart in the chart wizard. Despite what the icon shows, and despite your first impression of what "Line" chart might mean, this chart type does not allow you to plot the relationship between two variables. The X values are not treated as values at all, but merely as non-numeric placeholders. If you select a Line chart, you will get one of the following charts. On the left is the most likely chart you will get. 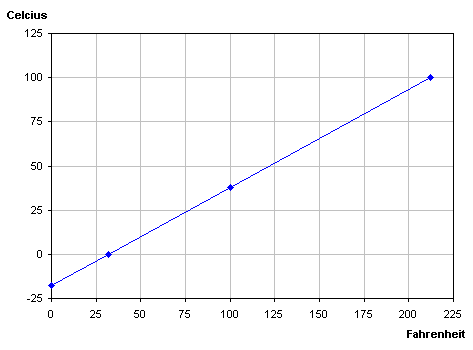 Instead of plotting Fahrenheit vs. Celsius, the chart shows both Fahrenheit and Celsius as separate series, plotted vs. point number (if Excel doesn't know what to use as X values or category labels, it uses 1, 2, 3, etc.). If you are smart or lucky enough to define a line chart series with Fahrenheit and Celsius temperatures as its X and Y values, you will get the chart on the right. Sure, 32�F corresponds to 0�C, but the Fahrenheit values are plotted with equal spacing between them, even though the values are not equally spaced numerically. Excel is merely using 0, 32, 100, and 212 as text labels for categories 1, 2, 3, and 4. See Scatter Chart or Line Chart? and X Axis: Category or Value? for more information about XY and Line chart types. The angles must be spaced appropriately so the plotted formula covers the intended range without sharp cusps; a 15� increment was found suitable for this exercise. The angles and calculated sines are filled down as far as needed. Only the first dozen or so rows are shown here, but the actual table extends to row 45, with angles up to 540�. As in the example above, the data is selected, and an XY chart is used to display the relationship between the two variables. Stephen Bullen, Charting a Formula - downloadable workbook that demonstrates the technique. Tushar Mehta, PLOT Manager - downloadable add-in that manages the technique for the user. Jan Karel Pieterse, Charting a mathematical equation using Excel and defined names - a web page tutorial with a link to a downloadable example workbook.